The Powersoft Duecanali 5204 is a professional power amplifier designed to meet the most stringent requirements of professional fixed installations. Designed by Powersoft R&D team the Duecanali 5204 is exclusively built in Italy with internal components selected for premium quality and proven durability. Each modular subassembly is pre-tested, and the assembled Duecanali 3904 receives a rigorous 48 hours burn-in before through final check-out on precision test equipment for total quality control. The Duecanali 5204 incorporates the legendary patented Powersoft universal switching mode power supply up to 400VAC tolerant with Power Factor Correction providing users with worldwide AC acceptance and low consumption. Powersoft bridgeable switch mode fixed frequency class D patented outputs provide high quality sound, excellent damping factor and cooler circuits for stable performances over time and longer amplifier life. LCD display with lockable user menu for easy control of all amplifier settings. Auxiliary inputs, triggered by 24V command input for alarm and pre-recorded emergency messages. Output relay for each amplifier channel for reporting single channel fault conditions. Optional DSP provides to Duecanali 5204 DSP+AESOP full high quality on board sound processing. Sensing and communication board, standard on RS485 bus, Ethernet optional, provides full control and monitoring through Armonía Pro Audio Suite™, compatible with all other Powersoft K, M, D, Q and Ottocanali Series amplifiers. 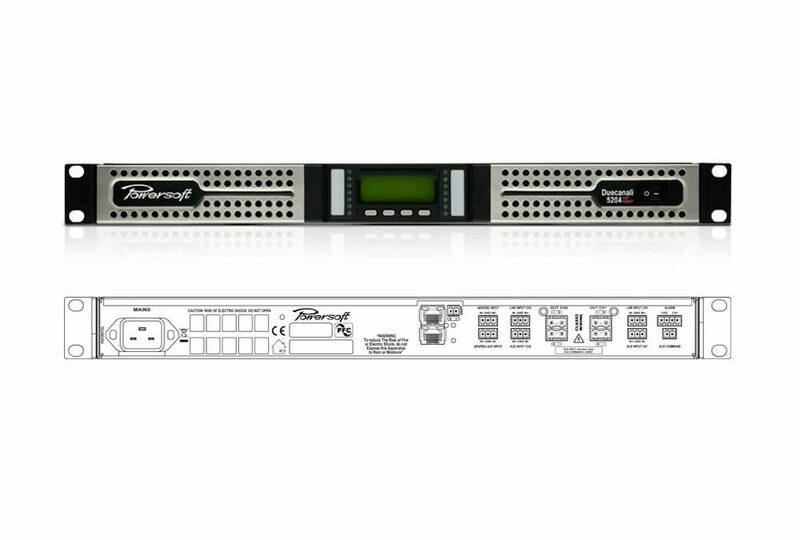 Interface available for MediaMatrix, Crestron, AMX, Q-SYS control and monitoring systems.